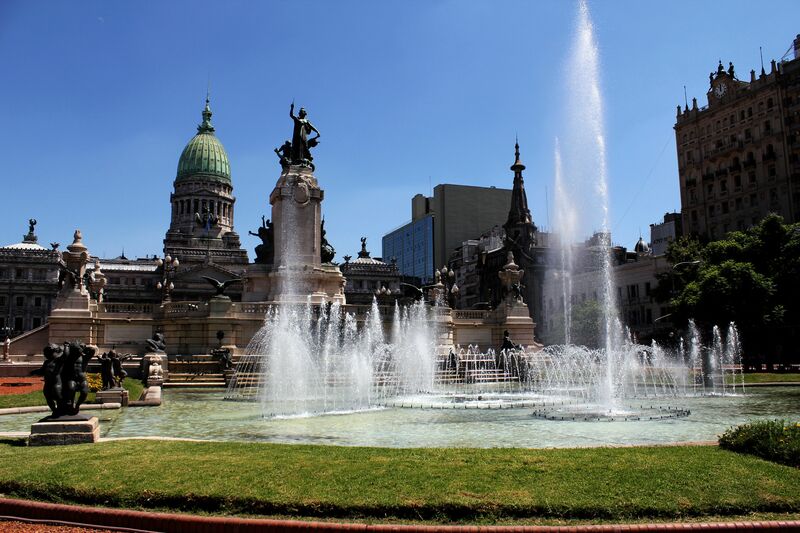 The monument occupies the central part of the Plaza del Congreso. Some visitors may be disappointed because since the recent renovation the monument is surrounded by the 3 meter (10 ft) high fence and not accessible to public. 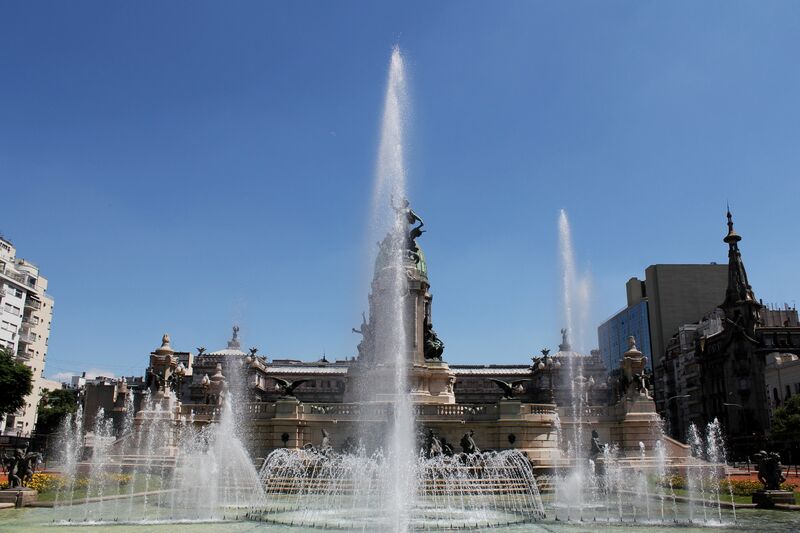 But given the fact that most demonstrations in the city either start or end on the Plaza del Congreso, it was a wise decision to protect it from frequent spray-painting and other acts of vandalism. 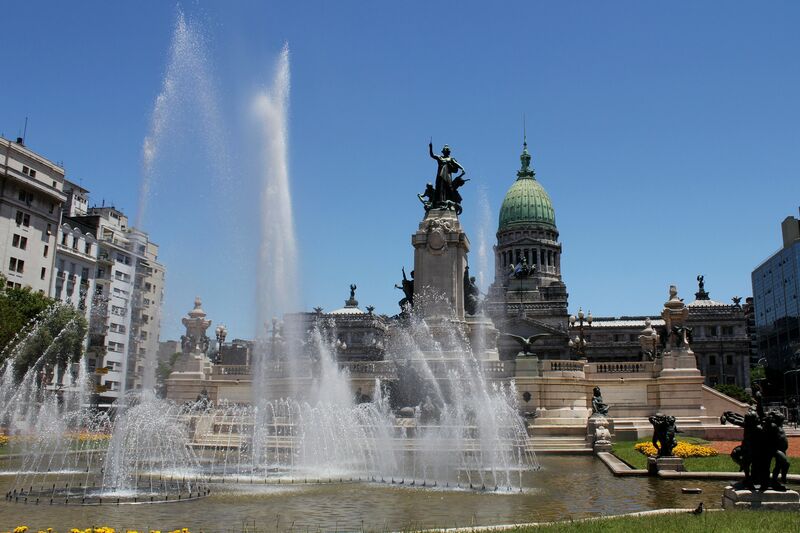 Like many monuments in Buenos Aires – the Monumento a los dos Congresos is an object of art, a lesson of Argentinean history presented through allegoric scenes and simply an object of beauty and admiration. 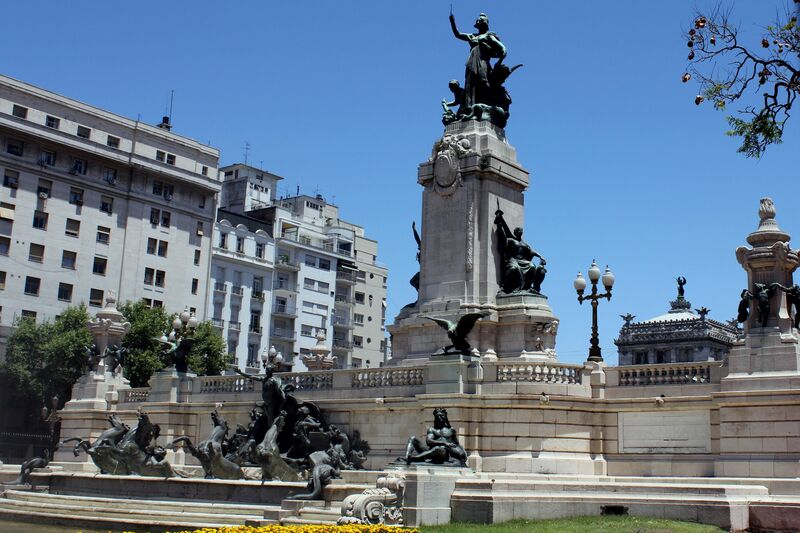 The monument commemorates two important events in the history of Argentina – the first Constitutional Assembly in 1813 and the Declaration of Independence by the Congress of Tucumán in 1816 hence the name - “Monumento a los dos Congresos”. Monumento a los dos Congresos. It is an impressive work of two Belgian artists - architect Eugenio D’Huique and sculptor Jules Lagae. It was completed in Brussels in 1909 and officially opened on the Plaza of Congress on July 9, 1914. 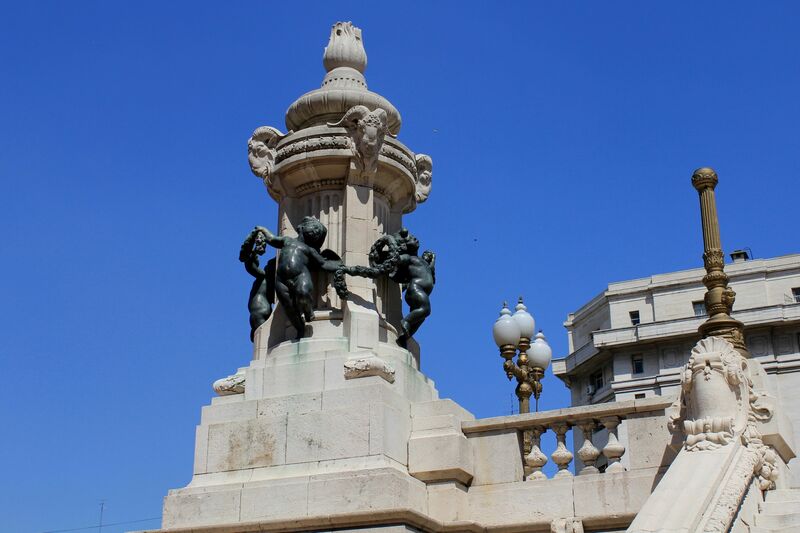 The whole monument is composed of a large, stone pedestal raised more than 4 m (12ft) above the street level, surrounded by stairways, pools, fountains and several groups of sculptures. The main composition topping the platform is an Allegory of the Republic. A half-naked female statue standing on a 13m high pedestal waves an olive branch in a gesture of peace, while her second hand guides a plow symbolizing the fact that hard working is an essential duty of all citizens to assure the future of the country. The snakes at her feet symbolize all “ills and evils” that The Republic may face on its way to the Prosperity (indeed, this warning turned to be a tragic prophecy in the recent history of Argentina). 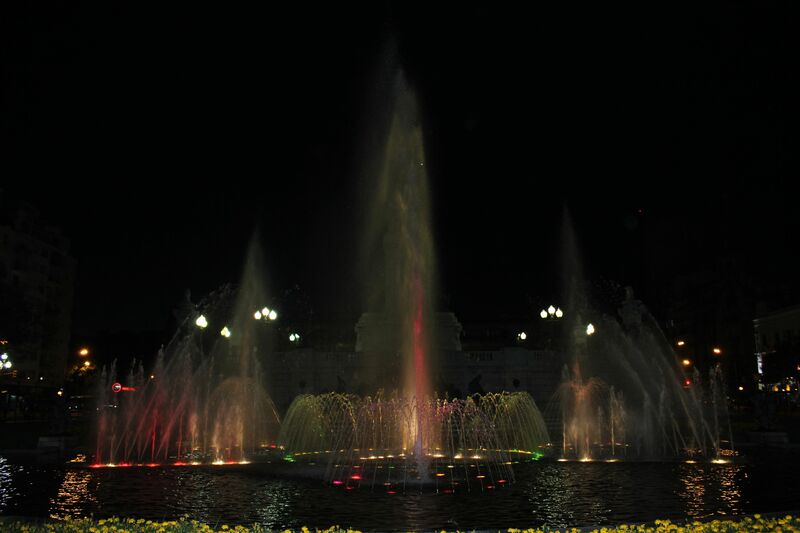 Fountains of the "Monument to the two Congresses" - Late evening "Water Dancing Party"
On the sides of the pedestal there are statues representing both mentioned congresses. The largest and possibly the most admired part of the monuments is located on the eastern side of the platform. 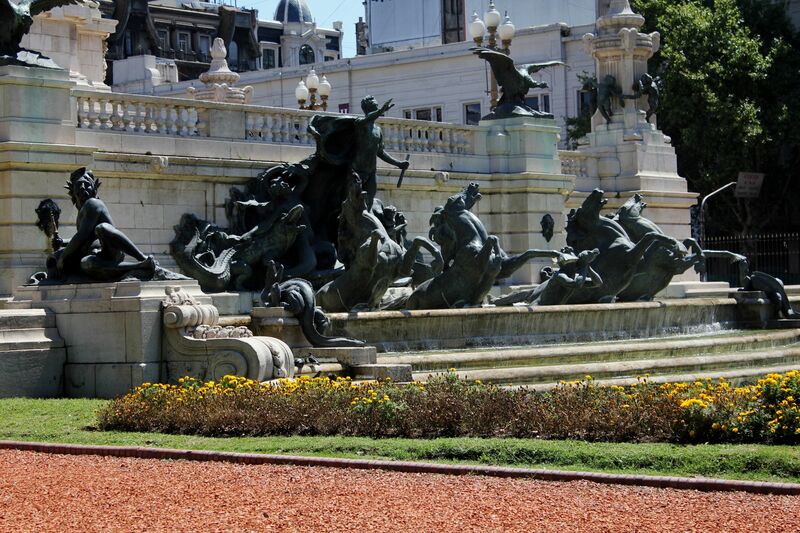 The complex of fountains is accompanied with several groups of sculptures including horses, condors and playing children – the latter in a symbolic way finding the safety under the wings of the new Republic. Like in every symbolism, imagination plays a key role. The Monumento a los dos Congresos obviously is not an exception from this rule – some will see the raised pedestal reflecting the high Andes on the western border and the large pond representing the Atlantic Ocean washing the eastern part of the country. 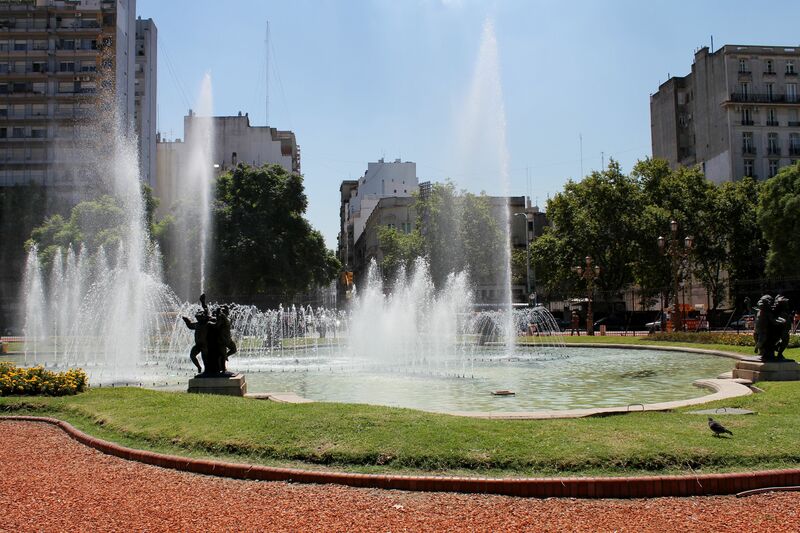 For others the main pond represents rather the Rio de la Plata and the upper one (smaller) with sculptures of two gods pouring the water to the lower pond – symbolizes its tributaries: Rio Parana and Rio Uruguay. Whatever is the symbolism of this large complex of masonry, bronze and water, undoubtedly it is a remarkable piece of art. 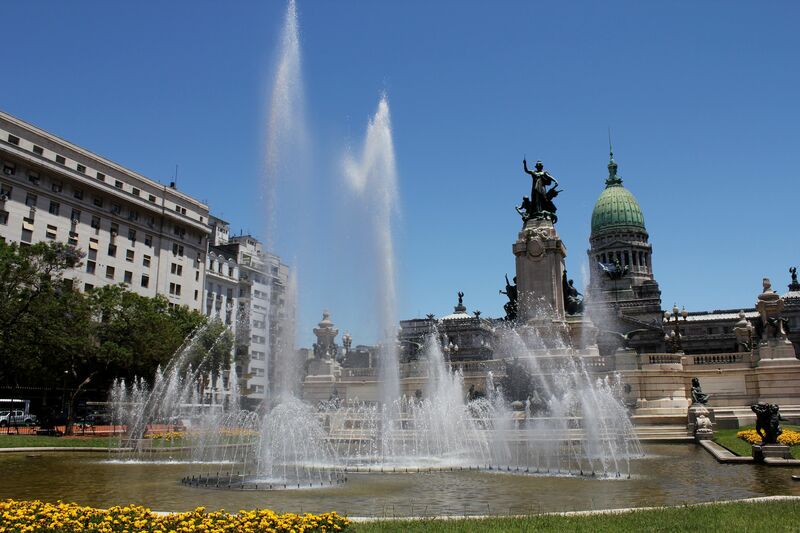 It is worth to note that the fountain from the “Monument to the two Congresses” is a largest one in Buenos Aires and it offers a fabulous spectacle of water and light…. 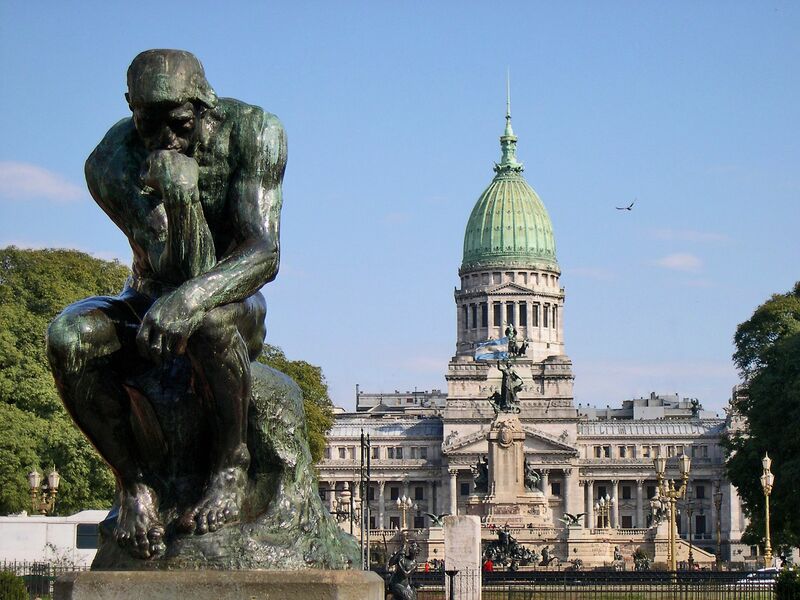 The statue El Pensador (inaugurated in 1907) is a bronze replica of the famous sculpture “Le Penseur” (The Thinker) by August Rodin. The original was placed in front of the Pantheon in Paris (now in the Musée Rodin). Throughout the years several copies of this Rodin’s masterpiece were made, however the Buenos Aires’ replica is one of only two in the world casted from the original form and signed by Rodin. The sculpture - initially called by Rodin “Le Poète” (The Poet) supposedly represent Dante Alighieri meditating in front of the Hell’s Gate (part of the Divine Comedy). Naked body exposing tight muscles and veins expresses the deep and intense meditation of a man facing a serious dilemma…. The Thinker represents a revolutionary change in the art by showing a real person - muscular, athletic man expressing an abstract and elusive process of thinking – seemingly two things “not going together”. Yet Rodin in his Le Penseur was able to reveal intense emotions in a harmony with the man’s strength …..
Till the time of Rodin, “thinking” was rather presented in the allegoric form and associated with the goddess Athena. Moreno was an Argentine lawyer, journalist and statesman playing leading role in the first national government of Argentina. He is recognized for his unorthodox thinking (as for his time) - for example promotion in the military ranks according to merits rather than to affiliations, importance of the support of “lower classes” for the success of the Revolution of May, some kind of “freedom of press” etc… . The monument to Mariano Moreno was inaugurated in October 1910. It is a work of the Spanish sculptor Miguel Blay. By presenting Mariano Moreno on the top of the mountain (symbolized by the raw block of granite) with a condor behind, the artist symbolically portrayed him as a man of “high flying thoughts”. Certainly the Parliament building, Monumento a los dos Congresos and El Pensador are essential parts of the Plaza del Congreso. However our tour of the square does not end here. In fact, there are many architectural marvels and “cultural heritage” places surrounding the plaza that should not escape your attention. 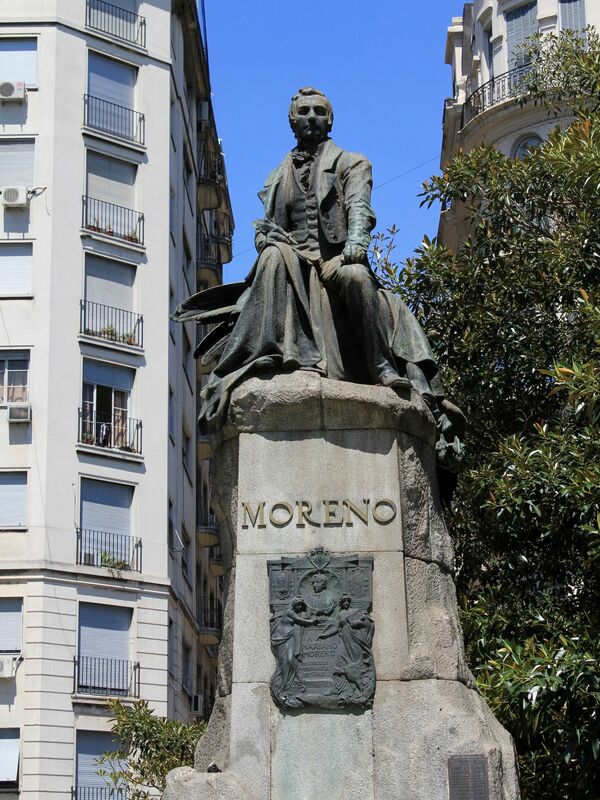 The next page presents you one of the most famous Buenos Aires’ landmarks - El Molino. We will also show you the “touch & spirt” of the famous Catalan architect Antoni Gaudi materialized on the façade of the building on the Rivadavia street.